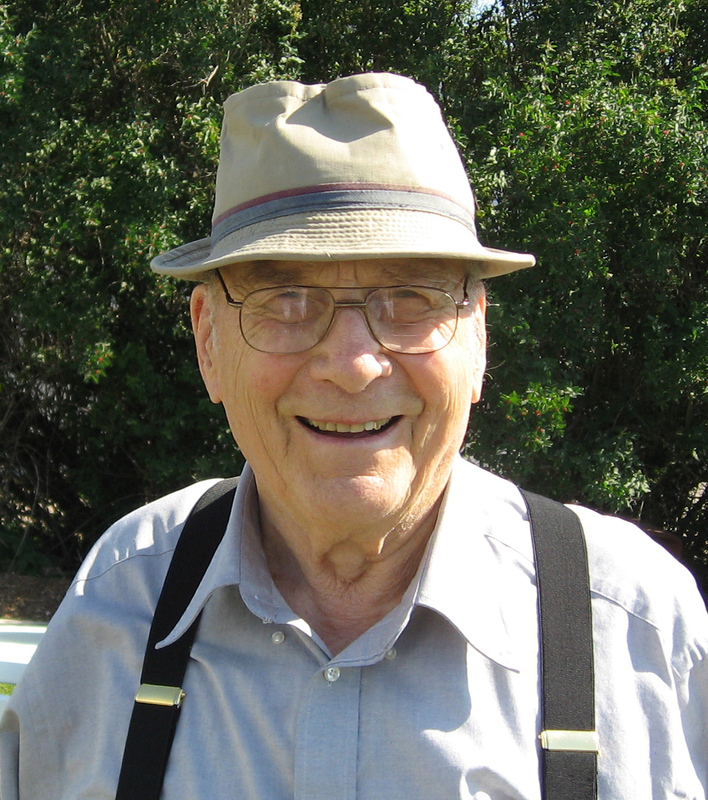 Deane C. Gunderson, age 91, died on Thursday, July 1, 2010, at the Israel Family Hospice House in Ames. Deane Charles Gunderson, son of John Christian Gunderson and DeElda (Lighter) Gunderson, was born on September 16, 1918, in Roosevelt Township, Pocahontas County, Iowa. He graduated from Rolfe High School in 1935 and received B.S. 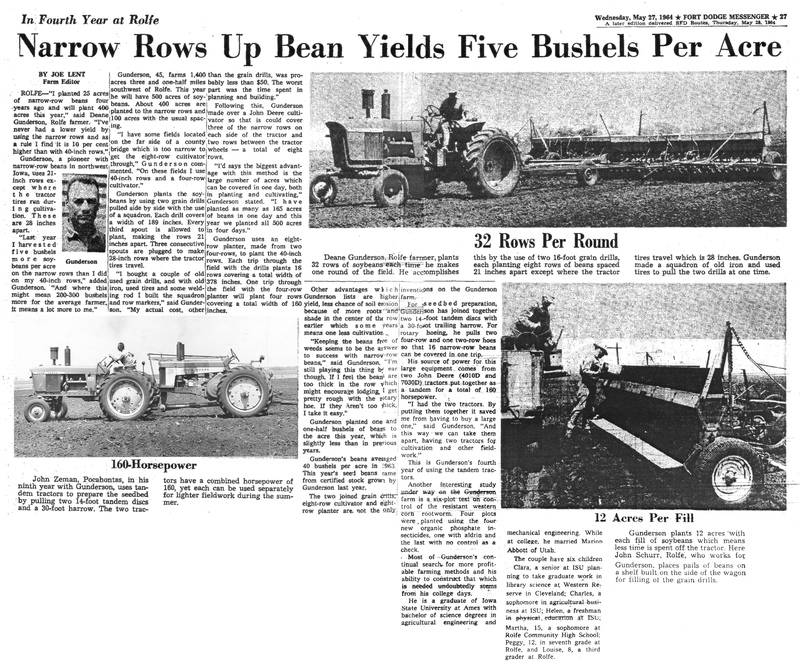 degrees in Agricultural Engineering (1939) and Mechanical Engineering (1940) from Iowa State College. On July 23, 1941, Deane Gunderson and Marion Abbott were married in Ogden, Utah. They resided in Waterloo, Iowa, for nearly four years while Deane worked as an engineer for the John Deere Tractor Company. In 1945 Marion and Deane moved with their three young children to the farm southwest of Rolfe where they continued to live for six decades. 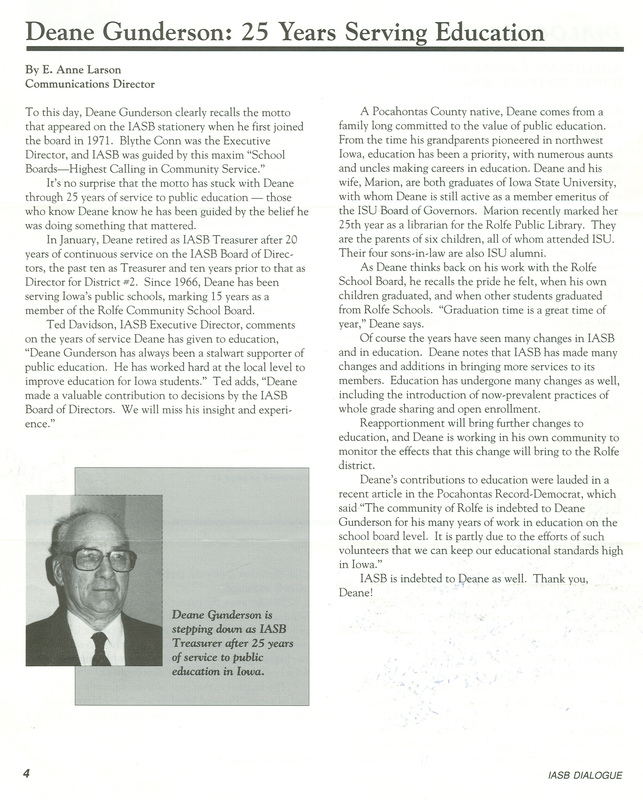 Deane was a member of Pi Kappa Alpha Fraternity, president his senior year and president of the House Corporation for 24 years. He was active in the Republican Party, Community Chest and Lions Club, and a Life Master in the American Contract Bridge League. Deane was a member of the Shared Ministry of Rolfe. He served on the Board of Directors of the Rolfe State Bank. He was involved in public education for 25 years, having served on the Rolfe Community School District Board of Directors from 1966 to 1981, and as a Director and Treasurer of the Iowa Association of School Boards from 1971-1991. He also served on the Board of Governors of the Iowa State University Foundation. 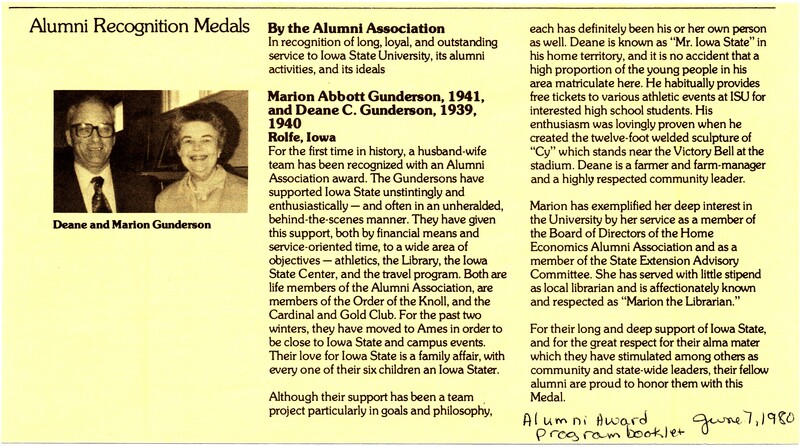 In 1980, Iowa State University awarded Alumni Recognition Medals to Deane and Marion. He was an avid Cyclone fan and in 1975 created an 11½-foot, welded sculpture of Cy that stood at the north end of the ISU football stadium for many years. 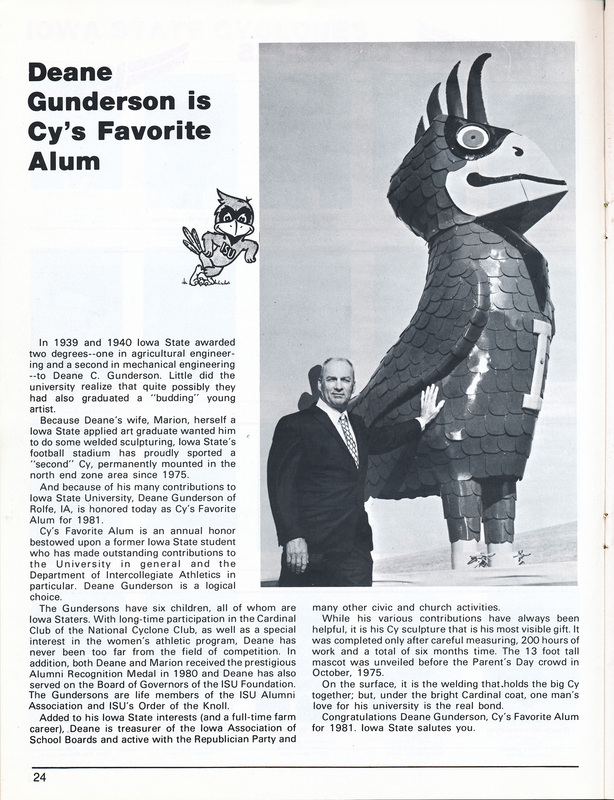 In 1981 Iowa State named Deane as Cy’s Favorite Alum. During 1975-1977, Deane wrote a weekly column, “Bubbles in the Wine,” for The Rolfe Arrow. His interests included farming, education, mathematics, welding, land surveying and farm drainage systems. He specialized in creating larger combinations of farm machinery* for increased production per farm worker. He seemed to have friends wherever he went and enjoyed engaging them with his stories. He was proud of his children and delighted in his grandchildren and great-grandchildren. He was a generous person, encouraged others in their endeavors and was noted for pointing out life’s wonders, including Sputnik, the Pythagorean theorem, bean seeds germinating, a fox den in a creek bank, and the West Bend Grotto. Deane was preceded in death by his wife, Marion, his parents, and one son, Christian Gunderson. He is survived by his son Charles Gunderson and wife Gloria; daughters Clara Hoover and husband Harold, Helen Gunderson, Martha Carlson and husband Michael, Margaret Moore and husband Jeffrey, and Louise Shimon and husband William; seven grandchildren: Christina Gunderson, Timothy Gunderson, Kevin Carlson, Joshua Moore, Jonathan Moore, Abigail Shimon and Kathryn (Shimon) Moon; three great-grandchildren: Michael Williams, Addison Valletta and Jackson Johnstone; and several cousins. A memorial service will be held at the Shared Ministry of Rolfe at 11:00 a.m. on Saturday, July 31. In lieu of flowers, Deane requested contributions be made to the Rolfe Lions Club (P.O. Box 101, Rolfe, Iowa 50581). Daddy’s obituary will be in today’s (July 21st) edition of the Pocahontas Record-Democrat. 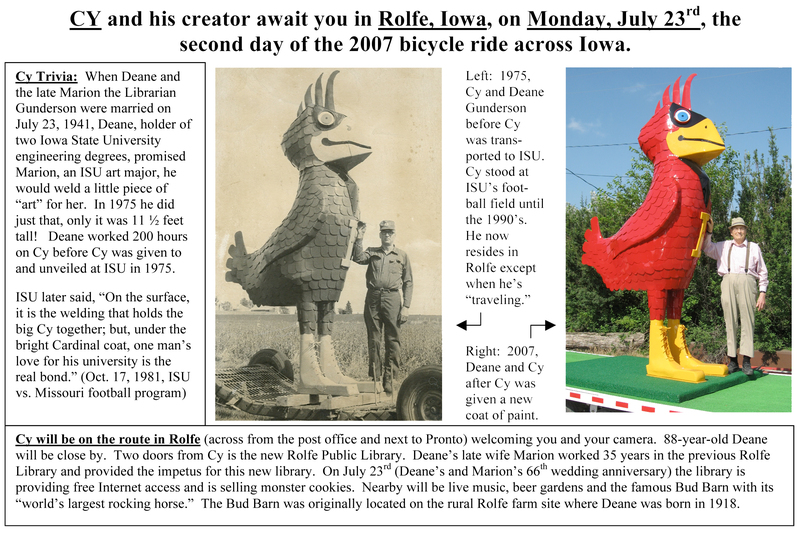 It will also be in this Sunday’s (July 25th) edition of the Fort Dodge Messenger, the Ames Tribune and the Des Moines Register. Sometime later I’ll post a bunch of photos of Daddy; in the same post as his obituary somehow just didn’t seem to work for me. If you are able to attend Daddy’s service and luncheon afterward, please be sure to let me know you are there. (I felt so bad that I missed some people who were at Mother’s service.) Also, if you can’t attend the service but think you will be in Rolfe later in the day on the 31st or sometime that weekend, it would be nice if you’d email (mariongundersonart@gmail.com) or call me to let me know; maybe we could work out a way to have our paths cross. This entry was posted on July 21, 2010 at 12:05 pm and is filed under Bubbles In The Wine, Deane Gunderson, Iowa, John Deere, Marion Gunderson, Rolfe. You can follow any responses to this entry through the RSS 2.0 feed. You can skip to the end and leave a response. Pinging is currently not allowed. I(les) have known Deane for 30 years and we have interacted in many places, especially at ISU basketball & football games. Rosemary and I always looked for Deane when we were attending women’s basketball games. Charles was usually with him and it was a joy to meet and greet him. He always seemed to be upbeat and able to enjoy life to its fullest. We will miss him a great deal. What a wonderful tribute! Looking forward to the photos. Thank you, Peggy, Les and Rosemary an d Tele. You know it — that we will miss him so much. Tele, I know you are a wonderful friend of Marti’s and that she has treasured you for years and years. I’m glad you are there for her always, and especially at sad (for us, but happy for Daddy) times like these. I was so glad that I was able to celebrate with the family at Grandpa Deane’s 90th birthday and was able to meet him. He was a very special man to many. What a great tribute to him. I send my condolences, as do my parents and sister and brother. We want to take a moment and share with you in your loss of Deane. We never had the opportunity to meet Deane, but if he was anything like his son Charles, he must have been a blessing to his whole family. He truly sounds like a man who had a lot of “irons in the fire” and was a very creative fellow. A man is measured in how he serves those around him and if he left life better than he found it. Sounds to me like Deane did both. May Jesus continue to comfort and carry you through.